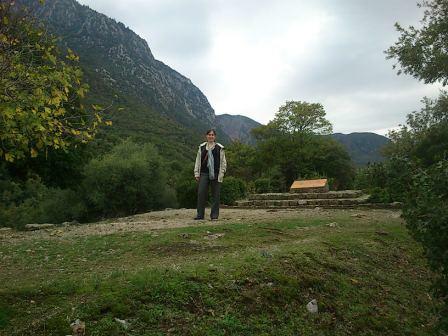 During our recent trip to Greece, on the way back from Meteora to Marathon we decided to make a short stop at the Thermopylae. Many battles have been fought at that place, but perhaps, the most known today is the one fought in 480 BC between an alliance of Greek city-states, led by King Leonidas of Sparta, and the Persian Empire of Xerxes I. I was curious to visit the place. That is the battle in which the movie “300” was inspired (*). We saw the movie again right after returning from the trip. As it usually happens, the movie puts some more drama to the story. 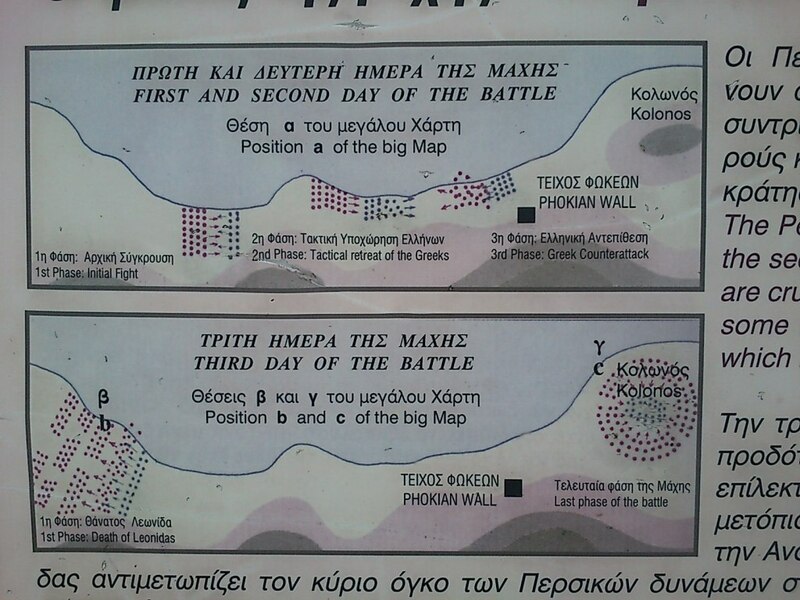 In the movie the battle field is a tight pass close to a cliff, whereas the Thermopylae are not such tight, and certainly there are not cliffs, rather plains from the mountains to the sea. Plains at Thermopylae from Kolonos hill. 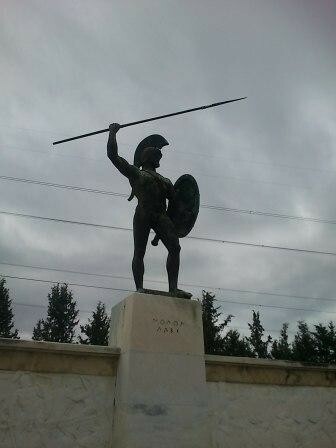 The movie has Leonidas as the very last Spartan to pass by in the fight, whereas in the explanation panels at the Thermopylae it is stated that he died in the very first phase of the battle, far from Kolonos hill (reading the Wikipedia article it seems that he could have survived to the last day). 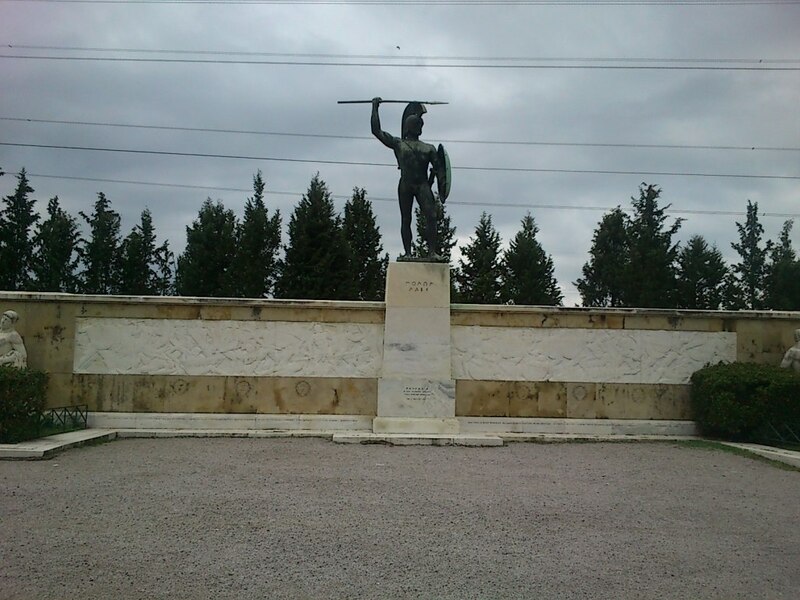 In the place there is a statue of king Leonidas, with the now famous inscription “ΜΟΛΩΝ ΛΑΒΕ“ (“Come and get them!”) which was Leonidas response when he was asked to turn their weapons. Today those words are used as a motto in several armies. There are many other sentences supposedly used by Leonidas that are repeated today, if only by the impact of the movie 300. Persian Emissary: […] Our arrows will blot out the sun! Leonidas: Spartans! Ready your breakfast and eat hearty… For tonight, we dine in hell! I expected to have found some more merchandising or tourism-related business created around the battlefield but we only saw the epitaph and statues, not a single selling post. Possibly in high season, during, summer time there are some, but not in late Autumn. I searched through the web and there are indeed Greek businesses which sell memorabilia related to the movie and the battle, it is only that they sell online and we didn’t encounter them at the place (compare that with the setting up of a food franchise business out of the movie “Forrest Gump“). I encourage anyone travelling through the Greek A1 on holiday to make the brief stop, as it doesn’t require a long detour from the highway and lets you quietly (and free) contemplate a place charged with History. (*) A sequel of that movie will be released in 2014, “300: Rise of an Empire“.